UPDATE check out Redirecting NSLog to a file for just capturing NSLog. is there some sort of restriction to the source? or is it public domain? MIT license. Use freely ! Right now, launching from the Finder blocks on reading … works fine in XCode and Terminal. 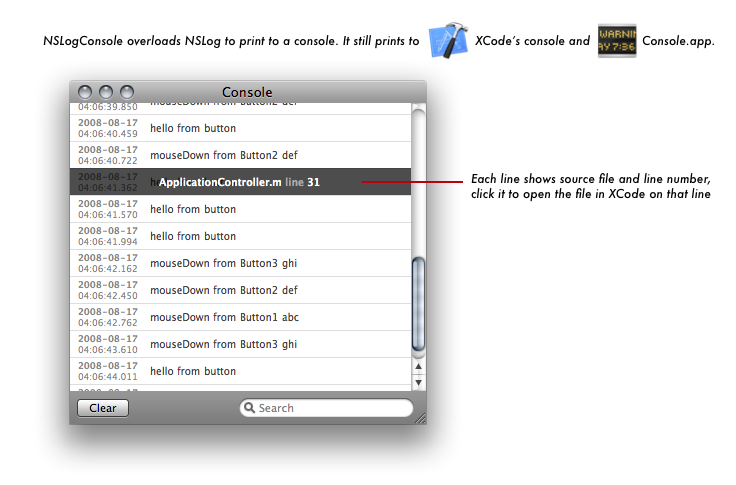 So don't use in production code :) Somehow stderr doesn't behave the same from Finder and from XCode. Any ideas ? Brilliant! This is really nicely done! Thanks for this wonderful peace of code. While testing I found that -init of NSLogConsole is called twice: 1st by NIB-Loader and 2nd by -sharedConsole. I run your code, in my prj. Some error comes up for webview didnot load html file before invoking it.